NBA 2K13 (XBOX 360 and PS3) console versions. Graphics: Any game including NBA 2K13 will always look better in PC depending on how powerful your machine is (Graphics card, RAM, CPU etc). Online Players: There are less people playing on the PC platform, making it harder to find quality opponents online. Definitely more players for the console version compared to PC. Game Modding: Insanely detailed user made rosters (Lots of people will make new rosters during the offseason, including next years rookies, free agents, etc) courts, uniforms, retro teams (ex. UBR by Hawk23), FIBA Mods and more. 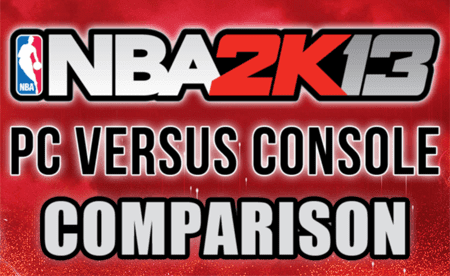 The PC version of NBA 2K13 is obviously easier to mod compared to the console version. • You can now use all the NBA Stars in NBA 2K13 Blacktop by using a custom roster. → "Unlock All Players in NBA 2K13 Blacktop"
• It's now possible to unlock the All-Star Teams in NBA 2K13 PC by using the → "NBA 2K13 Unlock Trainer"
I hope that explain why the PC version of NBA 2K13 is way cheaper compared to the console version. Any comments or reactions? Post it in the comments section below.